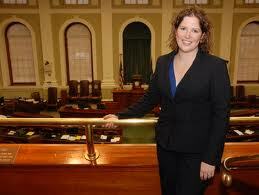 Good morning, I’m State Representative Emily Cain from Orono, the House minority leader. It’s the height of election season, which means most of you are probably fed up with all of the political TV commercials, radio spots, and your overstuffed mail boxes. On Tuesday, all of that will end. And this election will come down to you. The noise will stop and you will have choices to make when you enter the voting booth. No matter what political party you belong to or who you plan to vote for, your vote matters. It counts. There is a lot at stake for our country and our state. Our state and our nation have serious challenges to address. But we can’t do it unless we have leaders who listen to us — and to each other. Maine needs lawmakers who work together to get our economy on track. We want results — not a partisan or extreme agenda dictated by special interests or big corporations. We want reasonable solutions for the problems we face each day. We need good paying jobs for a hard day’s work. We need a stronger middle class – that is growing not shrinking. A working mom or Dad should be able to go to their child’s soccer game after a hard day’s work — not head to a second or third job because they can’t earn enough at the first. An 82 year old grandmother should not have to choose between paying for her medicine or her groceries. No student should walk away from college or technical training because they can’t afford it. And, we need to make sure we have those engineering and technology jobs they trained for here in Maine, so they don’t have to leave the state when they graduate. We want clean air and water so our fishermen and farmers can continue to make a living here and support the amazing Maine brand across the world. But no one party can do it alone. We must set aside our differences to find common ground. When you get in that voting booth, you have an opportunity to send a strong message to our leaders. A message that says you care about the future of our state and our country. And that your voice will be heard. In Maine, we have a tradition of high voter turnout. We know how important our vote is and we won’t take it for granted. Our voting laws ensure that Maine people can conveniently get to the polls on or before Election Day to vote. The rules for voting are simple: You have to be 18 years old, a U.S. citizen and a live in the municipality where you want to vote. A photo ID is not required to vote. Again, you do not need a photo ID to vote. You can register to vote on Election Day. Do not allow anyone to intimidate and bully you at the polls. Sadly, some may try. The American Civil Liberties Union of Maine will be providing voter protection services on Election Day. Your vote matters; make it count. Vote on Tuesday, Nov. 6. Now let’s set aside politics and the election. I want to share some information on how we can help our neighbors to the south who suffered incredible devastation from Hurricane Sandy. In most of Maine, we were fortunate to miss the worst of the storm. Many of us want to know how we can help the families that have lost everything in the devastation. One simple and easy way each of us can help is to donate to the Red Cross. You can donate $10 by texting the word REDCROSS to 90999 or visit RedCross.org. Thank you very much for listening, I’m Rep. Emily Cain from Orono.